As a bookseller I think that board books may be one of the most overlooked categories of books. Yet these books are a child’s first exposure to books and to art. So, I want to take some time to give some love to some favorite board books already out for your little ones that I’m really excited about! 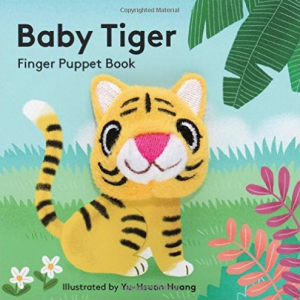 This combination board book and finger puppet is only one in a series of adorable animal stories. Short, sweet and sure to please a baby to two-year-old in your life. Follow Baby Tiger through a complete day from morning until night. Be sure to be on the look out for the Baby Reindeer version for a wonderfully sweet Christmas gift! Huang’s illustrations are winsome and welcoming with their gentle expression. These little books are a perfect addition to a little one’s first library. Sleepyheads caught my eye the minute I saw it, and stole my heart. This is an immensely soothing just-before-bed book. One by one the reader sees all different kinds of animals tucked into their beds. Each animal is plump and peacefully asleep or almost there. Every page is gently illuminated making the night seem welcoming and almost warm. 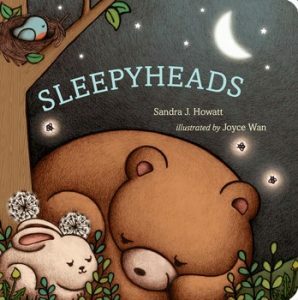 The text encourages children to name each animal and to look for the one sleepyhead at the end of the book that we are still haven’t found for, “But there’s one little sleepyhead who’s not in his bed. Where, oh where, could he be?” A satisfying ending when that particular little sleepy child is finally found! A great baby shower gift. 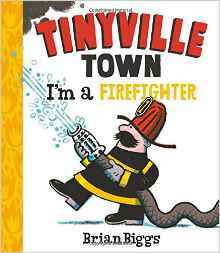 I showed this book to a friend who said, “What I like about it is that the firefighter’s moustache is like three stories tall.” Exactly! I love this firefighter and his enormous moustache. It’s a wonderful book for a little guy or gal who loves to see those firefighters hard at work. The book goes through the day in the life of a fireman and his co-workers (which include a female firefighter). They have an action packed day from the first ring of the alarm bell to the well deserved sleep at the end of a busy day. The team fights fires at a bakery and come home with baked goods! What’s not to love? The illustrations are full of action, but the text is simple enough that little children won’t loose attention. Full of excitement, yet cozy enough to read at any time of day this board book, though recommended for preschoolers, would actually make a great purchase for even a one to two-year-old.